If you guessed jeans, then you are correct! Truth be told, I got these Silver Jeans a while ago but couldn't wear them out until I got them hemmed (problems of being petite). However, patience can be rewarding! I'm wearing the "Aiko" fit which is for curvier figures, especially in the hip and thigh area, and it just slipped on easily. There was no fuss to it at all and I loved how soft it felt. I'm usually not a jeans girl but now I want to start a collection, thanks to Silver Jeans for my new hobby (and why I need another closet)! Besides the fact that I'm wearing jeans (which is very rare of me), I got a hair cut over the weekend by my girlfriend and local OC hair stylist Scarlet from Blush by Scarlet who also did this fun little "mermaid-inspired" braid for me. This time I went a little darker since fall is approaching. I'm actually not done with my new 'do yet so I will showcase more photos after it's complete so stay tuned. 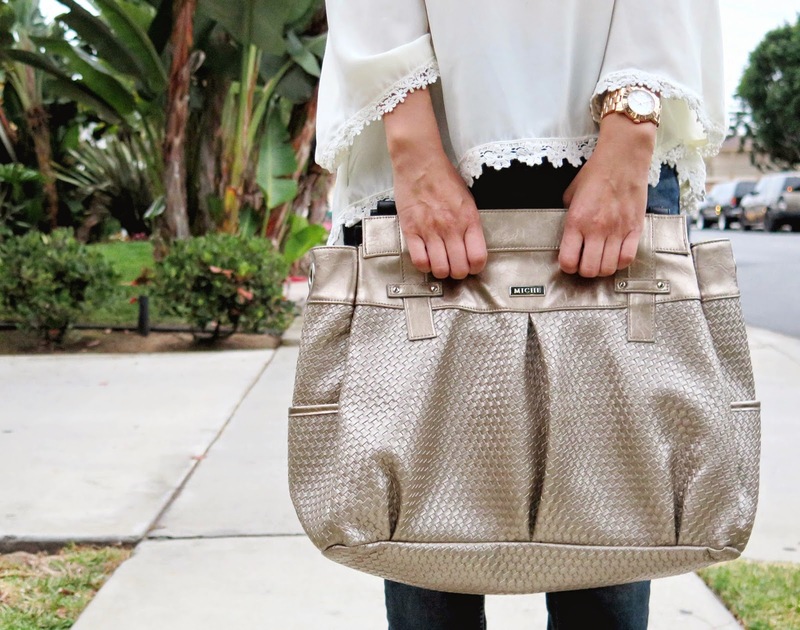 By the way, my new Miche bag is such a great every day bag to hold all your basic essentials. I'm always looking for a good big bag to hold my food and snacks whenever I go to the movies and this is definitely coming with me next time. Oh and I almost forgot! The biggest difference here is that I parted my hair to the other side. Sometimes small changes like that can really made a big difference. Also since it's a new week, I thought it'd be fun to have another giveaway, don't you? This time it's for a $25 e-gift card to a cute new and affordable online women's boutique Pink Blush (another top seen HERE)! 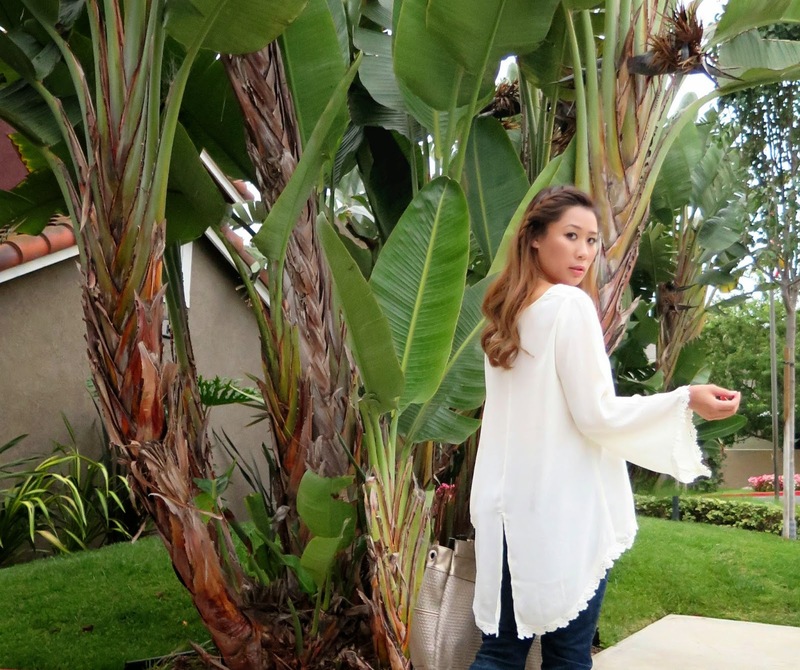 I wore their white crochet trim blouse in this outfit and loved how loose and airy it was. Definitely a great top to wear to buffets, just don't get it dirty (I always have bad luck when wearing white). 2) Follow @ShopPinkBlush on Instagram HERE. 3) Follow @kimberly_luu on Instagram HERE. 1) Like According to Kimberly on Facebook HERE. 2) Like Shop Pink Blush on Facebook HERE. 3) Follow @kimberly_luu on Twitter HERE. 4) Follow @ShopPinkBlush on Twitter HERE. 5) Tweet about the giveaway (see details below for more info). 6) Leave a comment with your name, email, and what you would pick with the $25 e-gift card. 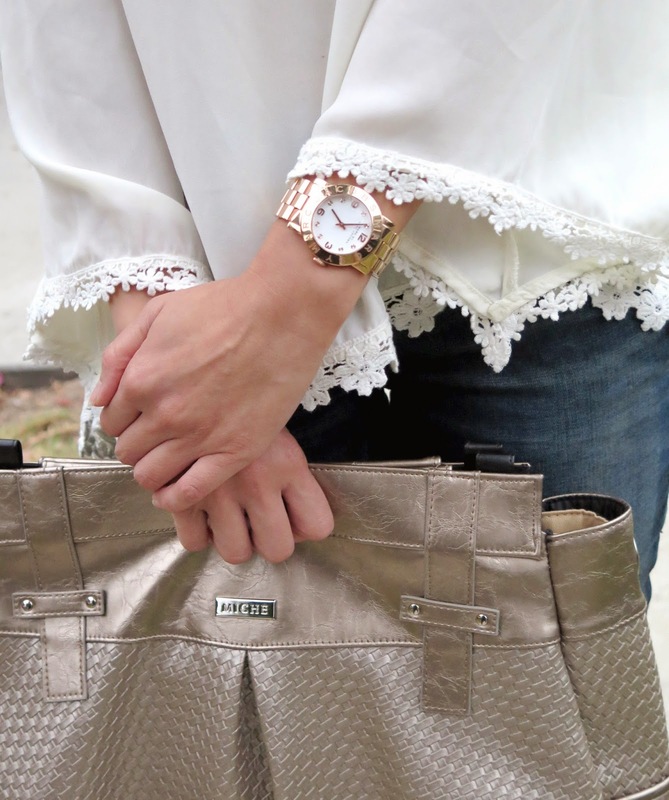 One winner will be randomly selected to win a $25 e-gift card to Pink Blush! Giveaway ends on Monday, August 25th at 11:59PM PST. Winner will be announced within 1 week after giveaway ends and an email will be sent for shipping info. If winner does not respond to email within 5 days then a new winner will be chosen. Open to U.S. residents only. Happy Monday and good luck everyone! I like the Grey White Striped Cardigan.